Cabbage rolls are considered as one of Sweden’s national dishes. But in fact, as it was imported by the Swedish King Karl XII from Turkey. It can be a little tricky to make but well worth the work. Boil a lot of water and salt. Cut around the head cabbage root so that the leaves can get loose. Boil the cabbage with the root upwards. Loosen and remove the leaves by hand as they soften. Add the leaves to drain. Mix the cooked rice with ground beef, milk, salt and pepper. Add a heaping tablespoon of the rather loose mince in a cabbage leaf , fold in sides and roll up into one package. Repeat with the next sheet and continue until you have run out of mince. Now it’s time to fry. Heat some fat in a pan. Add in some dolmar when the butter starts to turn brown, they should lie with the seam down at first. Steak dolmens neat golden brown around. Add them in a owen proff pan. Stir the sky in the pan with some water and pour this over the dolmens. After the roast in the oven, covered on low heat for half an hour. Post dolmens on hot plates and rode the gravy with a little flour and water. Bring to boil and season with soy sauce and cream. Next Post Saffron Clafoutis with apples – The best apple cake in the world? 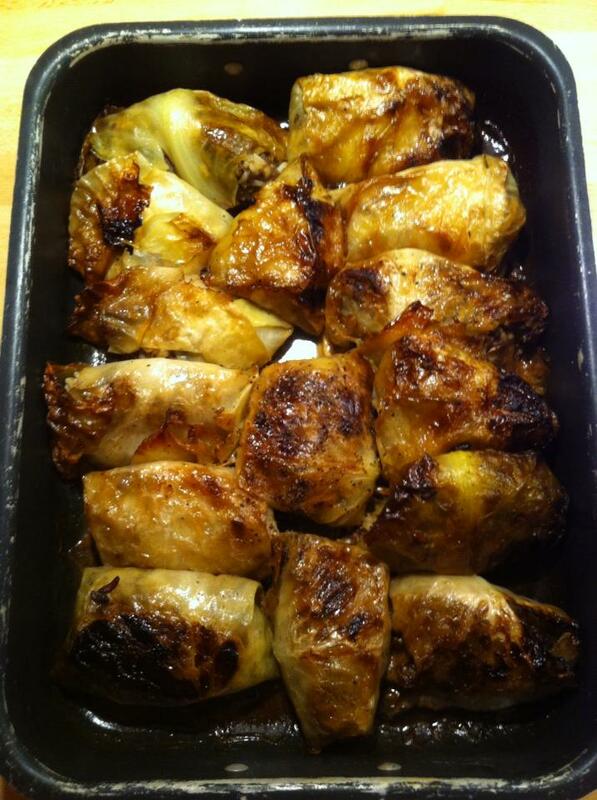 Oo what an interesting way to use cabbage – kind of like stuffed vine leaves! I think I’m going to give this one a go. Mom used to make stuffed cabbage and I really enjoyed them. I like that yours are browned on top, allowing the cabbage to caramelize a little. That always adds nice flavor to a dish and I bet your cabbage rolls are delicious.